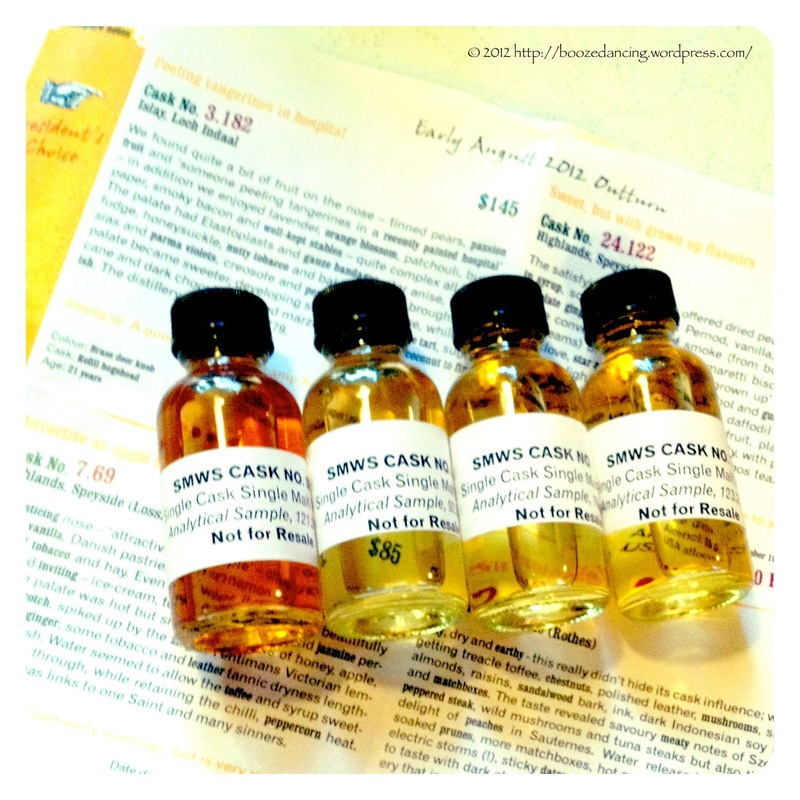 Our first batch of Scotch Malt Whisky Society Outturn samples. 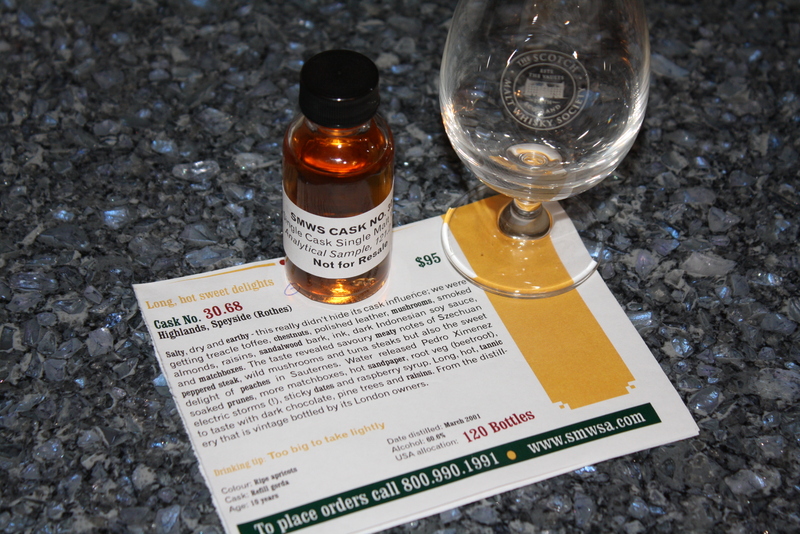 A while ago, G-LO received an email from the Scotch Malt Whisky Society of America (SMWSA) about a new program that they are starting whereby they will send samples of their newest Outturn offerings to various whisky bloggers across the country in order to get their opinions, and of course, create some buzz. Having attended the Society events in Philadelphia and New York and sampled some of the dozen or so Society bottles that I have purchased over the years, he, quite naturally, jumped at the chance as he couldn’t pass up an opportunity to get a sneak preview of their latest offerings. Salty, dry and earthy – this really didn’t hide its cask influence; we were getting treacle toffee, chestnuts, polished leather, mushrooms, smoked almonds, raisins, sandalwood bark, ink, dark Indonesian soy sauce, and matchboxes. The taste revealed savoury meaty notes of Szechuan peppered steak, wild mushrooms and tuna steaks but also the sweet delight of peaches in Sauternes. Water released Pedro Ximenez soaked prunes, more matchboxes, hot sandpaper, root veg (beetroot), electric storms (! ), sticky dates and raspberry syrup. Long, hot, tannic to taste with dark chocolate, pine trees and raisins. From the distillery that is vintage bottled by its London owners. Aroma: Alcohol, toffee and acetone. Taste: Alcohol, toffee, honey, a little bit of wood with an early burn in the back of your throat. With a little water, the alcohol notes are softened and flavors of buttered toffee and Lyle’s Golden Syrup and the burn is replaced with a pleasant, warming heat. As this is cask strength, it is a good idea to give it time to open up and add just a little water to soften the alcohol notes and bring the complex flavors to the forefront. According to the Society Distillery Decoder at The Whisky Portal, distillery #30 is The Glenrothes. I have had a number of The Glenrothes (the Select Reserve, the Vintage 1987 and the Vintage 1991) at the Philadelphia Society events. While they were all very good at what I would call regular strength (ABV 43%), the 30.68 is an amped up flavor explosion. This was a very nice whisky. If you are looking for something different and are not shy when it comes to cask strength, I think this is something you would enjoy.